Looking for a new winter coat? Well, take a few notes from Halle Berry. She was spotted outside the Good Morning America Studios looking super warm and chic in a gray high neck tie waist wool coat. For many of us we like coats in bright colors for the winter, but, a black or gray coat can be a standout with just the right details.We love how Halle”s coat has a high neck and buttons on the side. The tie waist shows off Halle’s waist and breaks up the bulkiness of the coat. 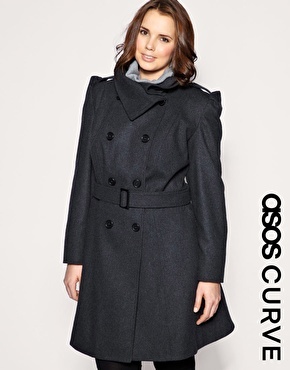 Get a similar look for your curves with this uber chic wool coat from ASOS Curve. We like that this ASOS Curve coat has some interesting details like the funnel neckline with twin epaulettes and structured pleated shoulder. This is the perfect coat to make you look chic and warm for the colder months. Plus, your friends will be glad that you gave that bright red coat a rest. As SC always say, curvy girls can look just as good as the slim girls do. *For my new followers, skinny girl fashion for curves is a feature that SC does where we take slender celebrity looks and show you how to recreate it for your curves. I have been doing this feature since I started blogging back in June of 2009.